The "Sussex", one of the next generation of waterproof and breathable blankets and sheets by Big "D". 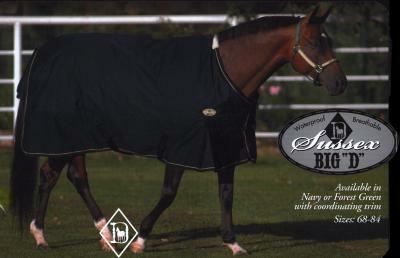 The "Sussex" is a 450 Denier rip-stop waterproof and breathable european cut turnout blanket. Heavy duty 210 taffeta Big "D" logo show coat lining with 240 grams of fiber insulation. It is great. Best things are the water resistance and no seam along the back to rub the hairs off of my horse's wither! Fits great. This is my second one and would recommend to everyone.